From Jerusalem, the eternal undivided capital of God, Torah, and Israel. About a boy, his Torah, and the big bad world. We also read as Maftir the mitzvah of the Red Heifer, the Parah Adumah, the prepared ashes of this cow will purify those who have the ultimate impurity, Tumat HaMet, coming in contact with a dead body. This, I believe, is the one ritual impurity that cannot be remedied by immersion in a mikvah bath and/or waiting in seclusion (something which will come up in the coming weeks in terms of the Metzora). It is near impossible to have the animal required for the mitzvah of Parah Aduma. I believe it has to be a perfectly red female (ie: no white hairs), be three years old without a single imperfection nor seeing a day of work in its life. The animal basically must be raised in order to fulfill this mitzvah. As I think about it, it is somewhat similar to trying to identify the messiah. There are so many requirements that eliminate so many possibilities. It is expensive to raise a cow, especially one that can never do work nor injure itself or be unhealthy. According to statistics I received in my halacha class last semester, it probably won't be an American cow -- very few cows in America are entirely healthy because of the way they are treated and what they are fed. The cows in Argentina however are considerably more likely to be glatt (ie: their lungs are completely healthy and therefore the rest of them is probably healthy. It is assumed that everyone in this day in age has Tumat Hamet. Whether you've been to a funeral or have been in a cemetary or a building with a dead body, or even been in an airplane that flies above a cemetery (because Tumat Hamet is the one impurity where the sky's the limit -- literally, there is no limit to how much death ascends to the heavens creating impurities. 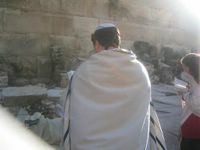 Nobody, Israelite or Kohen is considered free from this impurity and therefore nobody is able to ascend to the actual area of the Beit HaMikdash, the Holy Temple (though many will go to the outskirts of the Temple Mount, but only after going to the mikvah, not wearing leather shoes and abstaining from sexual relations between the mikvah and the ascent. The reason we read this maftir now is because the Pascal Lamb involves the pilgrimage to Jerusalem and an ascent to the Temple, which requires ritual purity. I love the haftarah that corresponds to this maftir. "I will sprinkle upon you pure waters/waters of purity and will purify you of all your impurities and from all your idols I will purify you. And I will give to you a new heart and new soul I will give within you and will remove the heart of stone from your flesh and give you a fleshy heart. (and so forth from Ezekiel 36). Good stuff. Shavuah Tov and may Hashem grant a Refuah Shleyma to Elan Shlomo ben Smadar. A new twist on agunot: chain the husband! A Procrastination Project copyright 2003-2010 (5763-5771). Picture Window theme. Theme images by stellalevi. Powered by Blogger.